Marshall goaltender (1) Mason Campion could be tested by high-powered offenses such as Luverne and New Ulm. Photo by Tim Kolehmainen. Luverne's Cody Christensen (11) captains his high-scoring squad. Photo by Tim Kolehmainen. The trip to the state tournament in March has been somewhat harrowing for New Ulm the past few years. The two-time defending Section 3A champion has had the misfortune of drawing the eventual champion in each season -- first an 11-0 loss to Breck in 2010 then a 13-2 defeat to St. Thomas Academy last winter. While the seeding hasn't been kind, don't expect the Eagles to fear a return trip to the X. New Ulm (14-11-0) is the favorite to again advance out of Section 3A and expects to do just that. A handful of Eagles have known nothing but ending their season in St. Paul each winter, including leading scorer Brody Peterson (37-24-61), who finished eighth in the state in goals. Peterson has been a part of each of the Eagles' state tournament teams and would like nothing better than to reverse the team's first-round fortunes. He has plenty of offensive help from Jeff Banal (12-34-46), Dylan Schreckenberg (17-29-46) and Judd Davis (13-19-32) on a team that scores 4.8 goals per game. Banal is actually a defenseman with the ability to join the rush at any given moment. Along with Timmy Kehren (4-10-14) and Connor Stark (2-12-14), the trio form the backbone of New Ulm in its own zone. While they've been able to rely on longtime goaltender Blake Burgau in the Eagles' past two state tournament berths, the three-year starter graduated in the spring. A trio of goalies have taken turns trying to replace Burgau, with sophomore Brach Kraus (8-3-0, 2.08, .900), junior Jordan Kokesch (3-4-0, 3.69, .876) and senior Willie Osborne (3-4-0, 6.26, .852) splitting time. New Ulm didn't see many section opponents during the regular season, but did go 6-1-0 in seven games, sweeping a pair from both No. 6 Litchfield/Dassel-Cokato (5-20-0) and No. 7 Fairmont (5-17-0). New Ulm edged Marshall (15-7-1) for the top seed in the section playoffs, although the two teams did split during the regular season -- the Eagles' only section loss. The Tigers took the first meeting, 4-3 at New Ulm on Dec. 8 but dropped the rematch 6-3 on Feb. 2 in Marshall. Marshall has balanced scoring, with no player with more than 13 goals or 26 points. But five have scored at least 11 goals and seven have double-digit point totals. Beau Mikel (11-15-26) paces the team in points, while Quinn Horvath (13-10-23) leads in goals. Sophomore Mason Campion (12-6-1, 2.99, .892) has seen most of the action in goal for the Tigers. The Tigers could give New Ulm a big challenge should they square off in the final, although first Marshall has to advance past a dangerous third-seeded Luverne (19-3-2) squad. The Cardinals have a powerful offense that averaged 5.8 goals per game and propelled the team to a closing 16-game unbeaten streak (14-0-2) that included a 5-2 victory over Marshall on Jan. 3 -- the second game of the run. Like Marshall, Luverne has balanced scoring paced by Skyler Wenninger (23-28-51), Austin Maxwell (16-30-46), Cody Christensen (16-25-41), Gunnar Olson (19-18-37), Jonny Solma (14-21-35) and Logan Norman (13-16-29). Beyond those half-dozen, another seven Cardinals have at least 10 points. 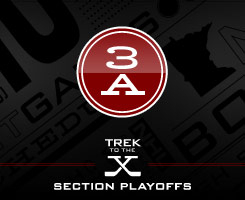 Section 3A has traditionally been a tough section for the top seed to advance out of, which could mean an upset for a team such as No. 4 Hutchinson (9-16-0), which has talent but plays a tough schedule. Travis Janssen (23-17-40) and Adam Eisenmenger (20-15-35) pace No. 5 Windom Area (11-7-1). 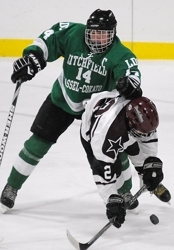 Sixth-seeded Litchfield/Dassel-Cokato started the year with five wins in its first six games, but dropped the final 19 games on its schedule entering the playoffs. Scoring has been an issue, as the Dragons average just 2.6 goals per game, the same total as No. 7 Fairmont. Only Ross Wilken (19-8-27) has more than eight goals for the Cardinals. No. 8 Worthington (4-13-1) will go as far as Ethan Stofferan (14-8-22) and Alex Kremer (15-3-18) can carry them, while No. 9 Redwood Valley (2-21-0) is paced by Chris Verdoes (11-15-26), Colin Bailey (12-12-24) and Jordan Skeie (14-4-18). Top-seeded New Ulm has been surging over the past few weeks, winning four straight games, including a 6-3 defeat of Marshall that secured the No. 1 seed over the Tigers. The Eagles have the ingredients to make a return trip to the X: the experience gained from two straight section titles, a star player who can carry the offense (Brody Peterson and his 37 goals), depth behind him (see Jeff Banal, Dylan Schreckenberg and Judd Davis) and a coach who has been there and done that in Erik Setterholm. 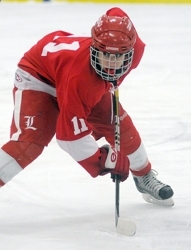 Luverne has the section's most potent offense (5.8 goals per game) and by far the best record (19-3-2). So why the No. 3 seed? It's all about scheduling. The Cardinals only played one other top seed (Marshall) and split with the second-seeded Tigers. Luverne gets buried in the far southwestern corner of the state and with that, sometimes is forgotten. But the Cardinals ended the season on a 16-game unbeaten streak (14-0-2) and look for some respect. Here's betting they get it.